By this time tomorrow, Eclipse Mars will have shipped. We will be enjoying many of the new features including improved Git support, docker tools, and a number of Java tool enhancements. But before Eclipse Mars ships, I still have two more entries in my Eclipse Mars 10 Top Features list. Number 2 on my list the automated error reporting. Instead of simply logging errors to the console, Eclipse can now report errors directly to the Eclipse committers; putting the information in the hands of those who can use it. When the first error is encountered, Eclipse will notify you of the error and ask if you would like to opt-in. Error reporting can be enabled anonymously or configured with your identity. Your identity will help committers if they have follow-up questions, but it’s not required. Now, when errors are detected, you will be prompted if you would like to send the details to eclipse.org. The details can be viewed before sending and once reported, Eclipse will let you navigate to the link to track the issue. Committers will be able to create bug reports from the data, see similar incidents and help triage issues as they come in. Finally, if a issue has already been fixed, Eclipse will notify you and inform you of the version that contains the fix. Error reporting is a very important part of software development. If the developers are not aware of the problems they are not going to be able to fix them. 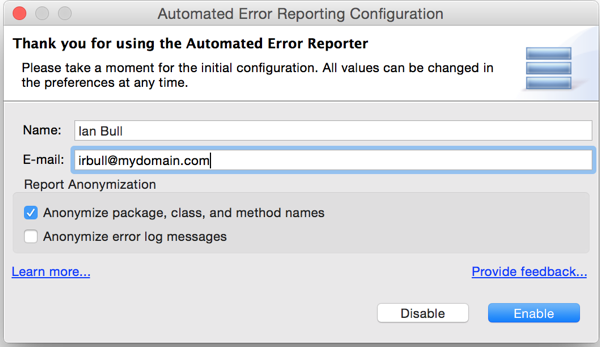 Now with the Automatic Error Reporting from Eclipse, it’s easier to report an issue than to complain about it on social media. For more information on the Automated Error Reporting, checkout the InfoQ article. For more Eclipse Tips & Tricks, and for my Number 1 Eclipse Mars Feature, follow me on Twitter.